Jack Skellington would be proud! “The Nightmare Before Christmas” can be the ideal party theme for just about any type of celebration, whether it’s Christmas, Halloween, birthdays or even a baby shower. 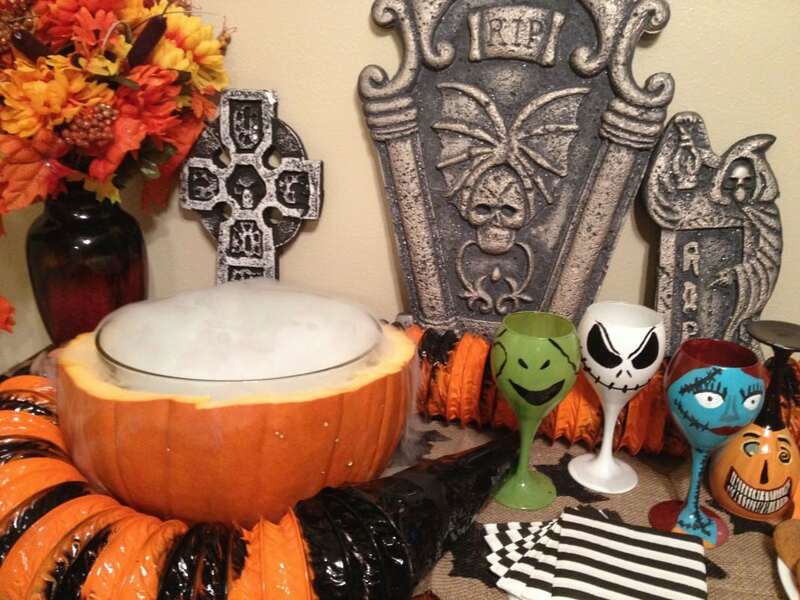 If you want the Pumpkin King to be an integral part of your next gathering, check out these frighteningly fun and creepily clever “Nightmare Before Christmas” party ideas for any occasion. Jack Skellington’s pet is a ghost dog named Zero. Krista Nash shared her DIY floating Zero decoration on her blog, Scrap Happens. All you need is some white fabric, felt, a pompom and wire (Krista recommends using white wire clothes hangers). 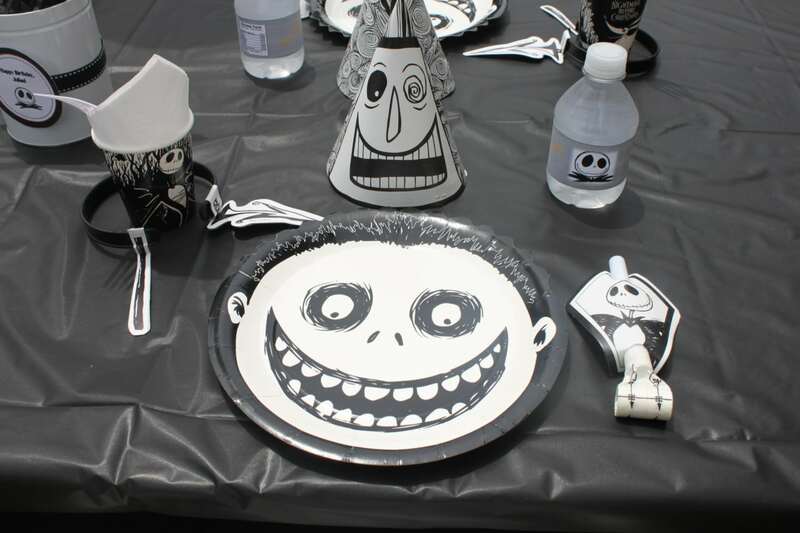 Used for a boy’s birthday party, these “The Nightmare Before Christmas” table settings are black and white with a touch of orange for the perfect pop of color. 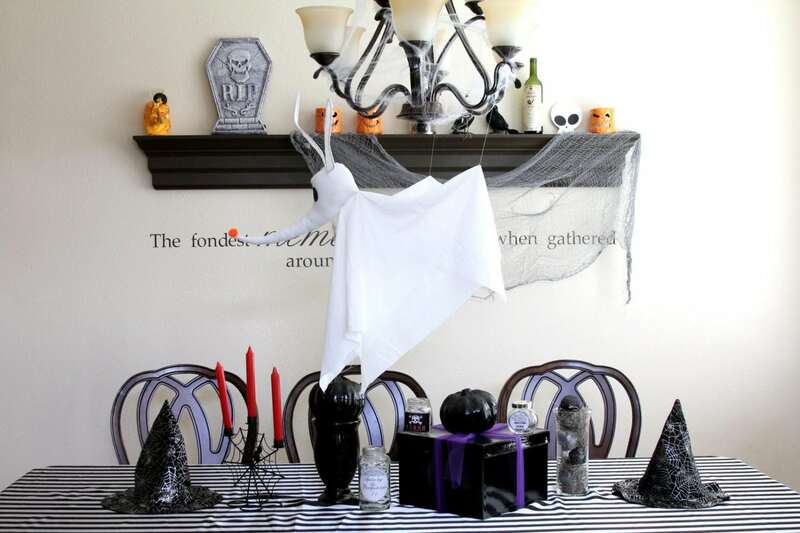 Shannon at Partying with the Princesses used a combination of DIY and store-bought decor to create this festive look. Serve green punch in a glass bowl tucked into a pumpkin shell. Turn it into Sally’s fog juice by adding dry ice. 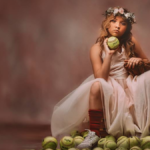 You can find even more ideas like this at Mad Like Alyce. 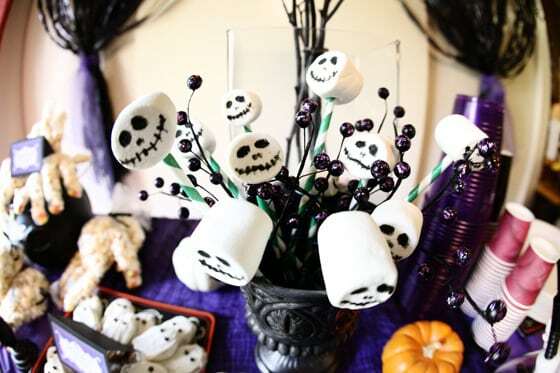 All you need are some paper straws, a bag of marshmallows and a black, edible marker to create a delightful and delicious centerpiece. Michelle Sterling shared this and other “Nightmare Before Christmas” birthday party ideas on her blog, Avery and Augustine. This amazing dessert made by Colorado-based Bold City Confections really takes the cake. The baker used special ingredients in the frosting to make the layers and decorations glow under a black light. If a large cake is not your cup of tea, think smaller and go with cupcakes. 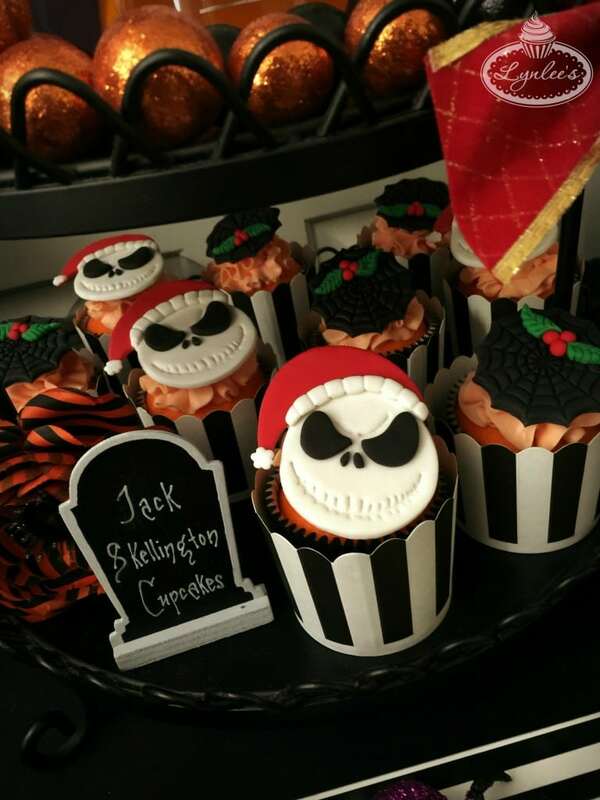 Lynlee North Beckett made orange cupcakes, topped them with fondant Jack Skellington toppers and wrapped them in black and white striped paper for a scary Christmas party. 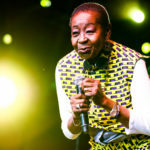 She shares other details on her blog, Lynlee’s. No tricks, only treats at this Halloween party. 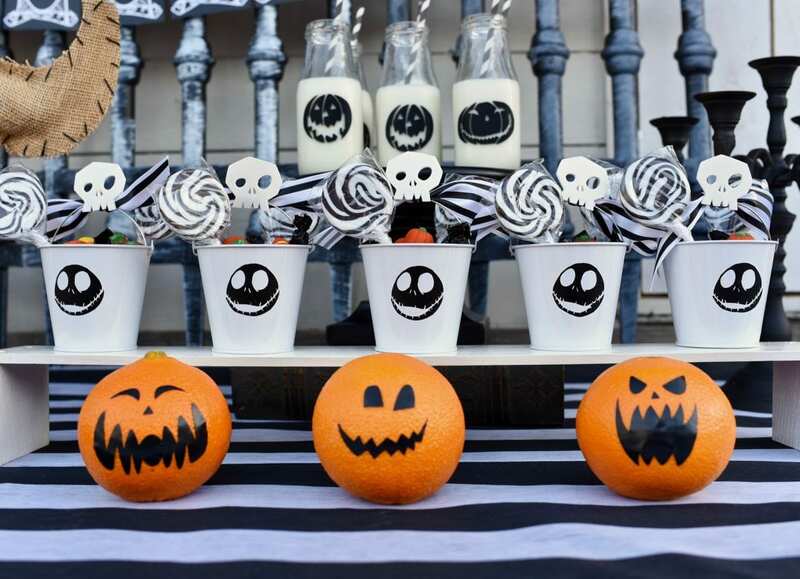 Guests received sweet oranges decorated like miniature pumpkins, jack-o-lantern-adorned milk bottles and goodie buckets with Jack Skellington, skulls and other black and white accents. Laura at Make Life Lovely used her trusty Cricut machine to create custom embellishments. 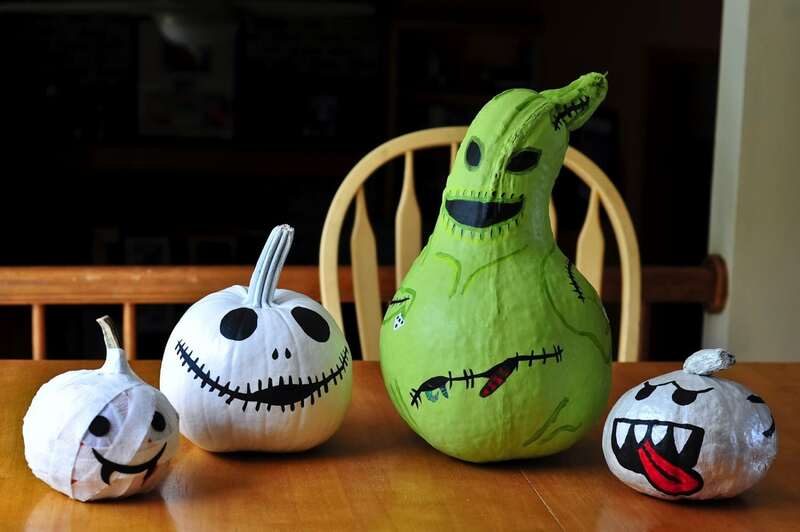 Paint pumpkins to look like Jack, Oogie Boogie and other “The Nightmare Before Christmas” characters. Bonnie at A Compass Rose used pumpkins, squash, paint and other supplies to craft a collection of party-perfect gourds. 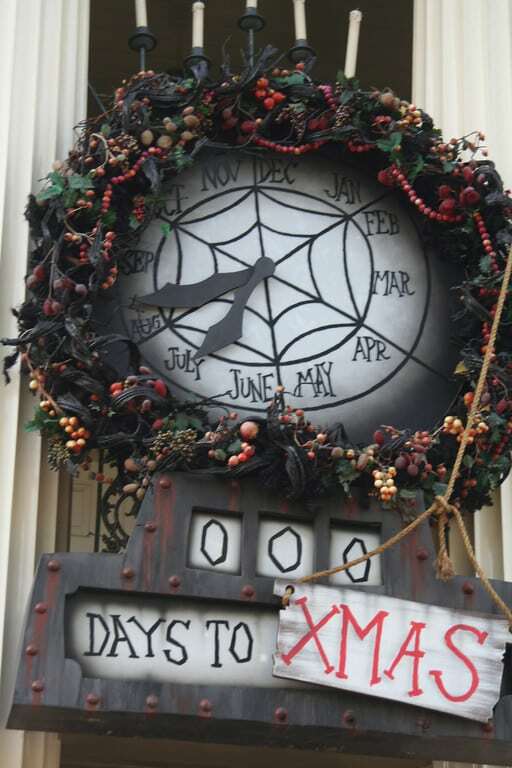 The countdown clock hangs in Halloweentown in the movie as well as over the main entrance to Disneyland’s Haunted Mansion during the holiday season. 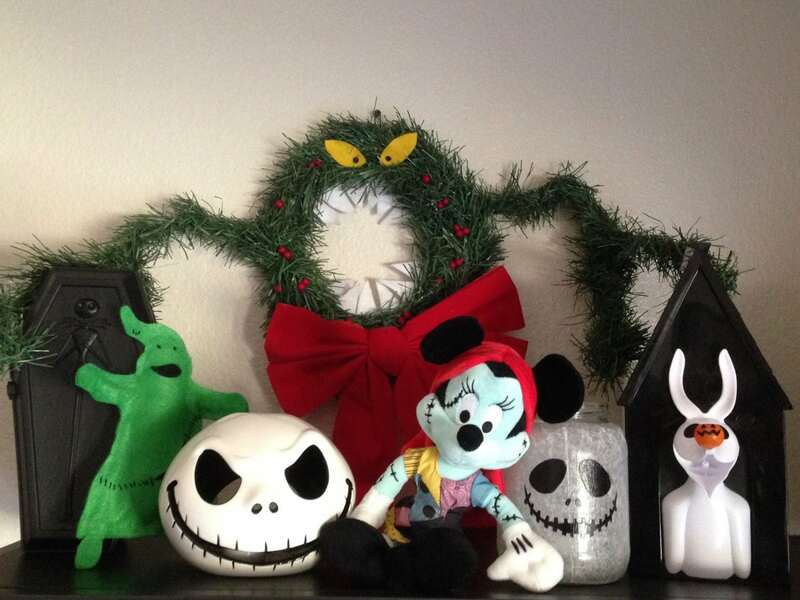 Kristie at Nightmare Before Christmas Props explains how to make a replica of the wreath for your party. Send guests home with unique goodie bags filled with treats or favors. Tessa Smith at Mama’s Geeky stitched up these handmade containers. 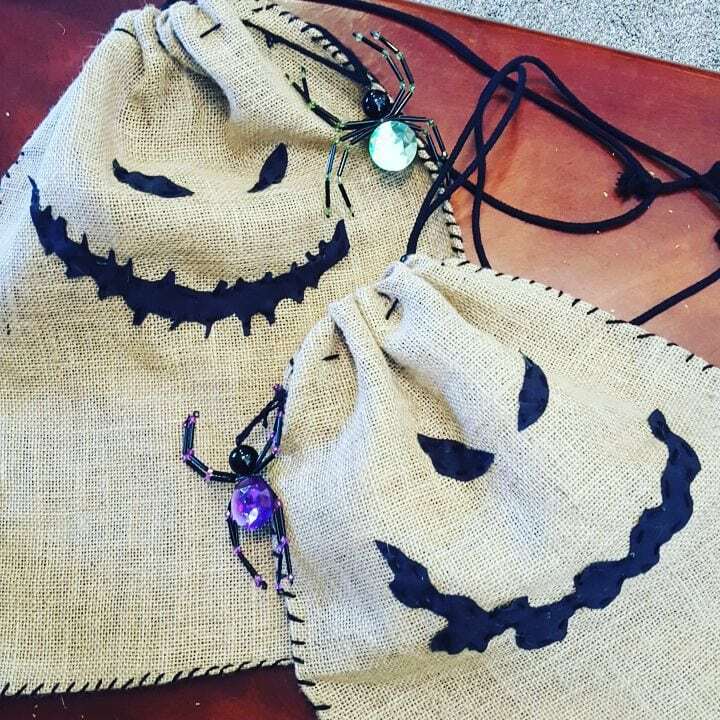 All you need is some burlap, yarn, a drawstring and black cloth for Oogie Boogie’s face. An edible bowl made to look like Jack’s face is a fun party addition. 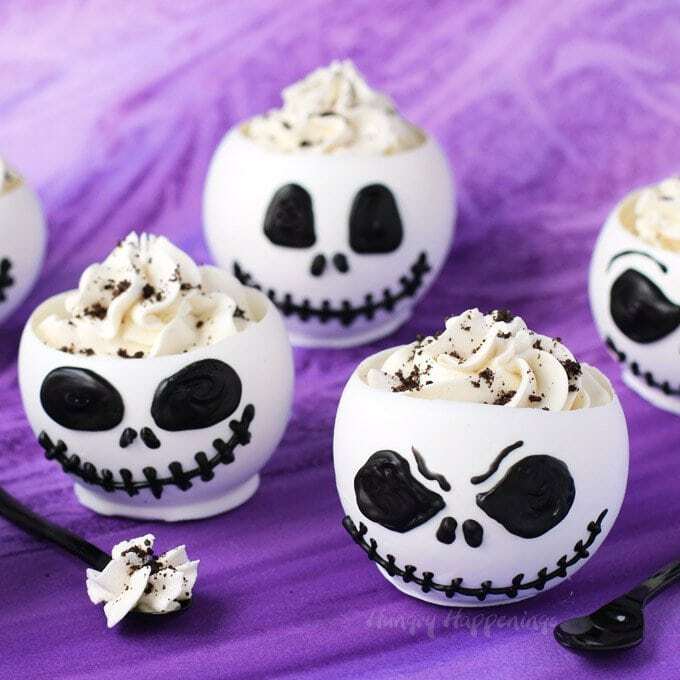 Fill the bowls with cookies and cream cheesecake mousse and your guests will be wowed. Beth at Hungry Happenings provides a tutorial for the bowls and a recipe for the mousse. 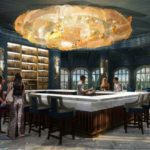 Jack’s sweetheart Sally is an expert when it comes to powerful concoctions. 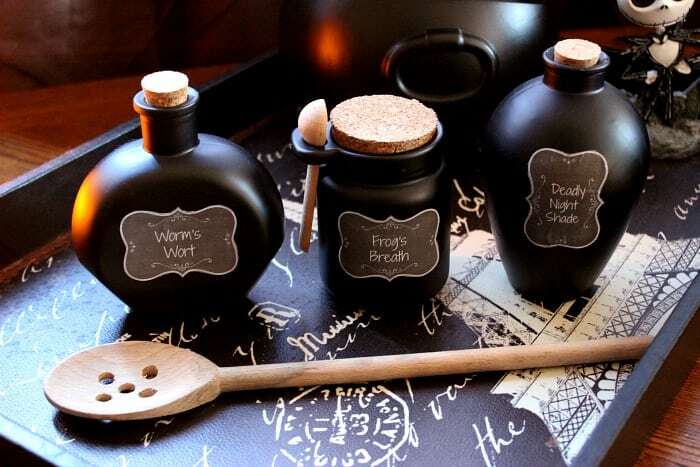 Decorate your party with replicas of her potion bottles. Angie at Big Bear’s Wife turned plain old glass bottles into elixir containers using spray paint, mod podge and a few other simple materials. Jack drops off a wreath as a gift at an old woman’s house in the film. Shortly after, it opens its eyes, sports tentacles and attempts to eat its recipient. Learn how to make your own party prop with help from Chrissy at Adventures in DIY. Don’t forget to deck the halls and decorate the walls. 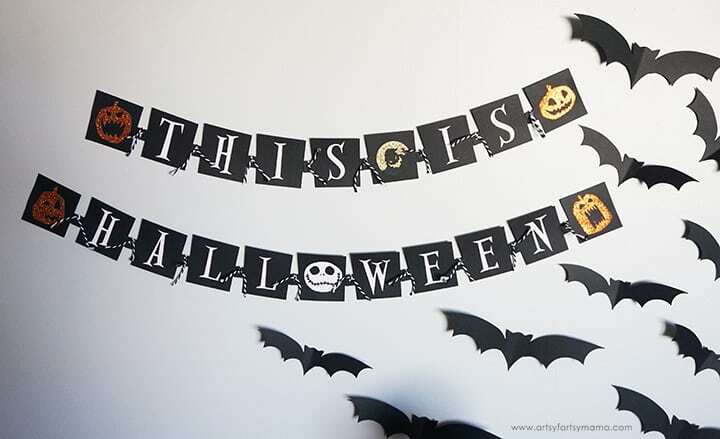 Lindsay at Artsy-Fartsy Mama used a Cricut to create a “This Is Halloween” banner and flying black bats. 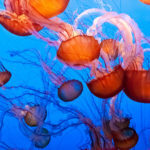 However, you could cut the shapes and letters out of paper by hand, as well.